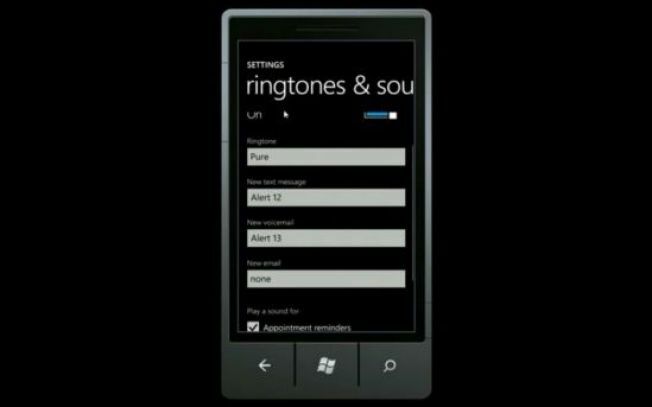 Why no ringtones, Windows Phone 7? If you're the type of person who thinks it's oh so cute when your phone blasts out Blondie's Call Me for a ringtone, strike the Windows Phone 7 off your shopping list. For some unknown reason, this most basic of features isn't available (yet) on any of the WP7 devices. I find most custom ringtones to be intensely annoying, so whether this missing feature should be on our list of seven awful things about windows Phone 7, or conversely on the seven great things list, will depend somewhat on your point of view. Ringtones are a surprisingly big business, so quite why Microsoft is denying wireless carriers this lucrative revenue stream isn't clear. There is a good chance however that the feature will be added in a future firmware upgrade. In the video from PocketNow, you can hear every ringtone included with the HTC Surround. To me, they all sound pretty lame.